WOOSTER, OHIO–This evening Dr. Whitey Hagadorn, an assistant professor of geology at Amherst College, gave the 29th Annual Richard G. Osgood Memorial Lecture to a large crowd of students, faculty and community members in Wishart Hall at The College of Wooster. His topic was “The First Animals on Land”, which was an account of research he and his students did with remarkable Cambrian trace fossils (tracks, trails and burrows) in sandstones in Wisconsin. Sedimentary structures In Upper Cambrian sandstones, Wisconsin, USA. On the left are ripples with raindrop imprints; on the right is an intertidal channel. Photographs courtesy of Whitey Hagadorn. Dr. Hagadorn showed in his presentation how he and his team first recognized ancient shoreline deposits by tracing sedimentary structures such as ripples, channels and raindrop imprints on extensive sandstone bedding planes in quarries. They could then follow trace fossils of mollusks, worms and arthropods out of the water onto what were sandy beaches in the Cambrian. Some of those organisms seem to have been carrying shells with them as protection from desiccation in the dry air. Dr. Hagadorn answered many questions after his lecture from the audience and from a good crowd at the following reception. We were impressed not only with the beautiful trace fossils and what they tell us about early land life, but also how such significant work could be done with simple tools and clever analyses. Trace fossils in Upper Cambrian sandstones, Wisconsin, USA. Photographs courtesy of Whitey Hagadorn. More details are available on his website linked in this post. Dr. Hagadorn will be leaving Amherst College this summer to become the Curator of Earth Sciences at the Denver Museum of Nature and Science. We wish him well. The Richard G. Osgood, Jr., Memorial Lectureship in Geology was endowed in 1981 by his three sons in memory of their father, a paleontologist with an international reputation who taught at Wooster from 1967 until 1981. 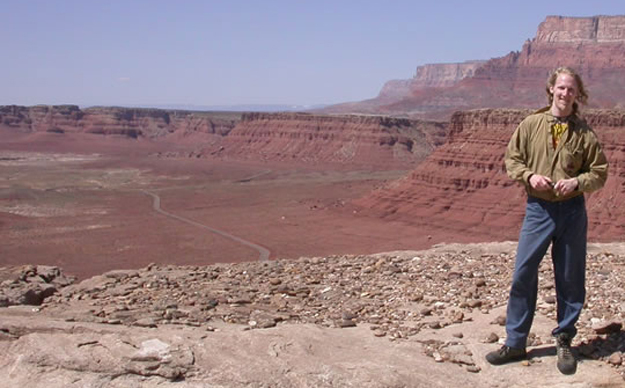 Funds from this endowment are used to bring a well-known scientist interested in paleontology and/or stratigraphy to the campus each year to lecture and meet with students.